There really is no doubt that co-creator and 'Metroid' director Yoshio Sakamoto was a bit of a fan of the 'Alien' films. Both the 'Metroid' game and 'Alien' films feature a female lead protagonist; Ellen Ripley in ‘Alien’, Samus Aran in 'Metroid'. They both see this empowered heroine fight extraterrestrial beings (one of which in the game shares a name with the director of ‘Alien’; Ridley Scott). If that wasn't enough, Ripley ends up scantily clad near the end of the film and if the right conditions are met Samus too ends up in a near state of undress at the end of the game. It's a comparison that Yoshio Sakamoto readily acknowledges. 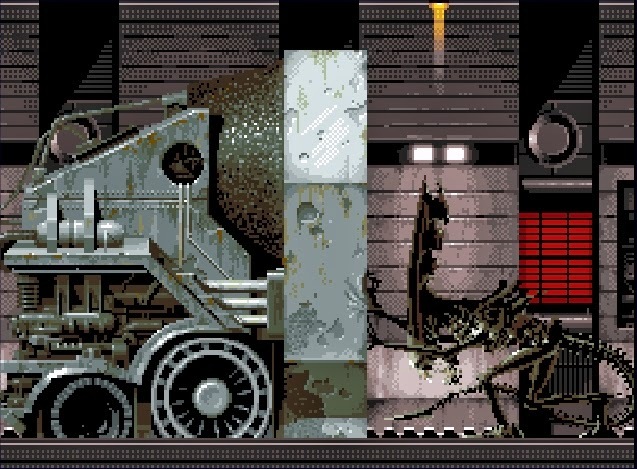 "I think the film 'Alien' had a huge influence on the production of the first 'Metroid' game." He told Retro Gamer magazine. "All of the team members were affected by [the] design and I think they were aware that such designs would be a good match for ‘Metroid’”. 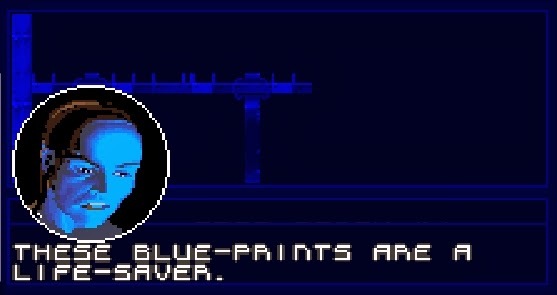 In a case of art imitating art, imitating art, how ironic it is therefore that when playing the video game tie-in for the film 'Alienᵌ' the best point of comparison is the 'Metroid' series. 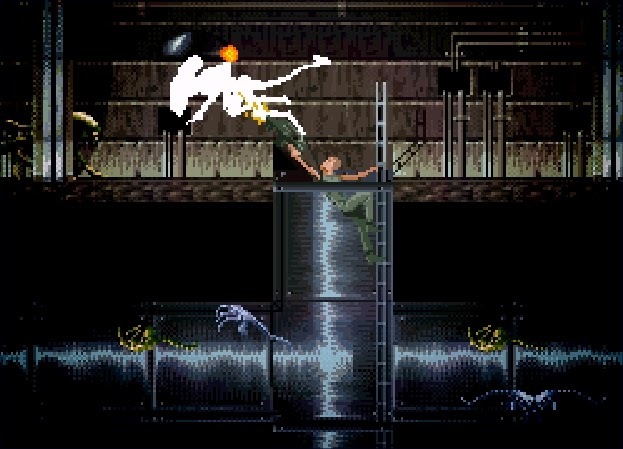 Whilst these games were influenced by the 'Alien' films, there really is no doubt that when adapting the third 'Alien' movie it was inversely the 'Metroid' games that the developers used as a template. 'Alienᵌ' is a side scrolling platform shooter, but coupled with the big guns and big explosions is an equally big chunk of exploration. Like the 'Metroid' games though front and centre is the atmosphere. It’s a game set in a tense scary world where even amongst endless foes you still feel a desperate sense of isolation and loneliness. The visuals are striking creating a bleak feel through realistic looking textures and lighting. Hallways are moody giving a sense of fear at what may lurk in the shadows and environments imposing filled with flames. Even though the room templates very quickly start to repeat, what is on offer gives a real sense of location. Some of the room backgrounds have impressive rain effects some show off great multilayered parallax scrolling, giving the game scope and depth. ”If I had to pick the one thing that really stood out about 'Alienᵌ' wrote Jonathan Davies in Super Play, “it would be the graphics. The sound would come a reasonably close second”. The original 'Alien' film taught us that sometimes the most powerful sound is silence, which may explain the sparse amount of music in 'Alienᵌ'. What is in the game is background music, quieter than the gunfire sound effects and alien shrieks. Limited to a handful of tracks, but all excellent in their ability to inspire a combination of dread and action. It's yet another way in which 'Alienᵌ' feels like the 'Metroid' games, showing a self confidence in an era when bombastic loud music prevailed in movie licensed action games. Of course huge liberties have been taken with the source material, as the film 'Alienᵌ' is clearly not an all guns blazing action film in the way its prequel 'Aliens' was. 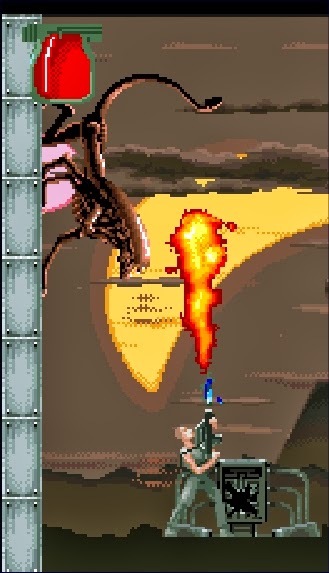 However, sombre examination of humanity and symbolism are not ideal subject matters for a video game, so what 'Alienᵌ' actually ends up being a fusion of the two very different films. 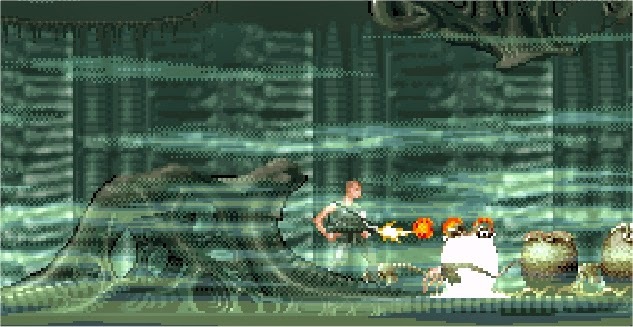 The weapons and amount of threats are taken from 'Aliens' but they inhabit environments inspired by 'Alienᵌ'. Super Play puts it best when they say “it makes effective use of the license, without trying to be too true to it.” Like the third film, the game sees Ripley trapped on a prison planet after her escape pod crashes into the sea. 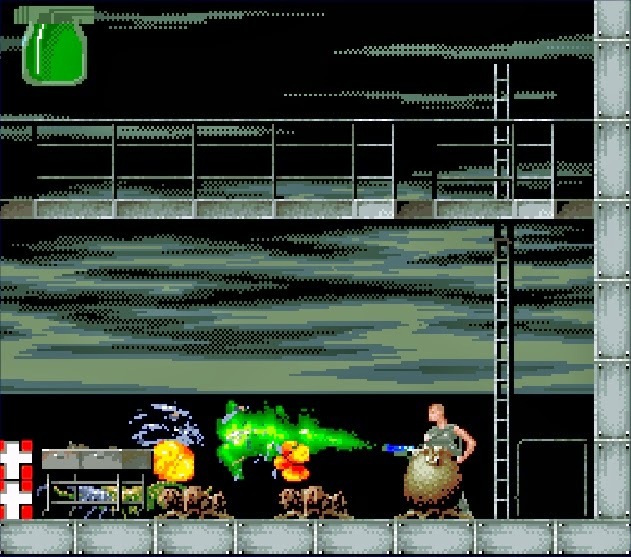 A similar setup is depicted in an opening cinematic, then largely told through on screen text within the game. Unfortunately, she's not alone. 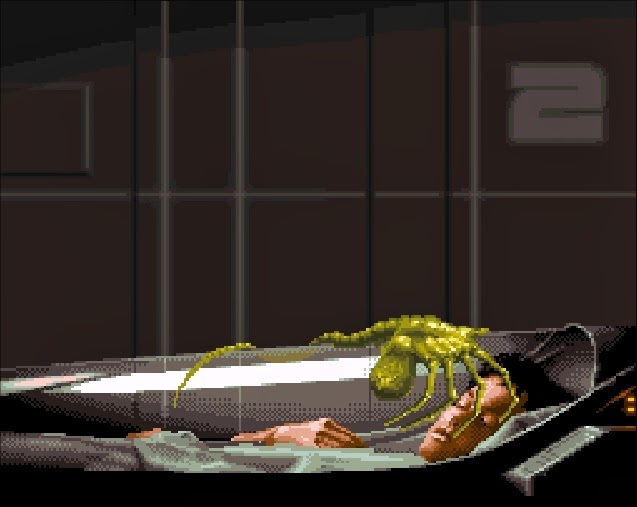 To make matters worse unlike the film's single alien stowaway the game seems to have limitless xenomorphs to flee and fight. 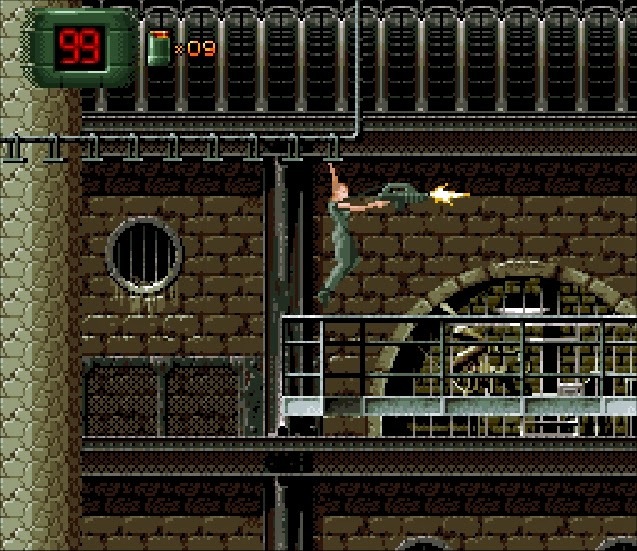 Also in a departure from the film (where there were no weapons in the prison that Ripley eventually ends up in) you’re armed with firepower similar to that seen in 'Aliens', with the game offering a flamethrower, automatic rifle, and grenade launcher, each mapped to a face button, allowing instant access to whichever weapon is befitting the situation. Clearly these are deviations from the source material to ensure a more enjoyable experience, but despite the abundance of weaponry it would be wrong to categorise 'Alienᵌ' as mindless blasting action game particularly on the Super Nintendo. While Probe Software developed a fairly standard platformer for everything from the Mega Drive to the Amiga, the Snes actually got an exclusive expanded version, with the inclusion of a mission-based system not seen on other systems. These missions are selectable from any computer in a central corridor can be completed in any order. Tasks include rescuing prisoners, destroying eggs, welding damaged pipes, and picking up power packs from one room and taking them a generator in another. It initially seems to be quite a varied game, a thinking man’s run and gunner particularly when ammunition is limited and stages needs to be approached accordingly. The method of killing the aliens requires an element of thought and care rather than wild relentless assault. They come in a range of different types, all meant to show various stages of the Alien lifecycle. Face huggers leap from eggs and must be shot from a crouch to hit successfully. Young aliens are slower and spit acid in deadly arcs, so need to be dispatched from a distance. Meanwhile the iconic fully grown Aliens will slink, pounce, and crawl on ceilings and come in different colours to denote their strengths. Though unlike their film counterparts they lack any intelligence what-so-ever and endlessly re-spawn. Each Alien simply patrols a short area near its spawn point and never gives chase. This does mean you can stop and plan, but it does mean that at no point will you be at any unexpected risk. Consequently despite being in a very dangerous situation, provided you are cautious, on easier levels you can actually progress quicker by avoiding threats. It's not a technique that works on the later levels though; the sheer numbers of aliens mean there’s too many of them for this approach. Level 6 in particular sees the difficulty spike significantly and success depends on your memory of where ammunition rooms are (which themselves require a huge amount of ammo to get to). It borders on frustrating and the excessive difficulty by the end really does feel like a conscious decision by the developers to make it practically impossible to finish. By that point though, a sense of repetition (like a scary alien) rears its ugly head. 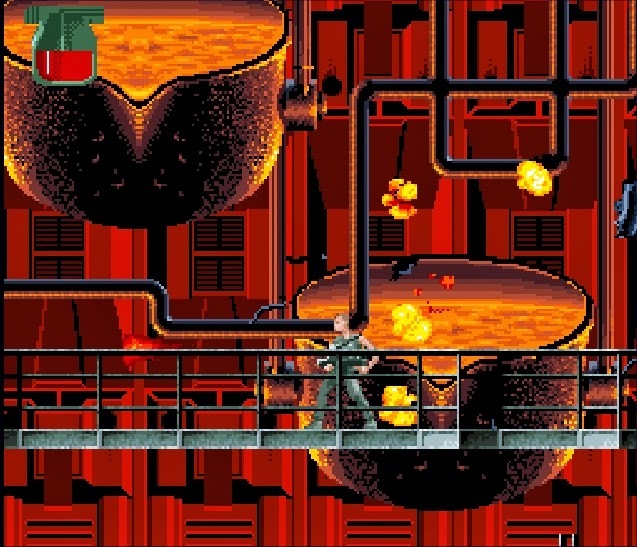 While the missions initially seem varied, most get recycled across the game as a whole with no new mission type introduced after the first stage. In fact, the only new additions later levels bring are tougher versions of the same foes and the introduction of alien queen mini-bosses. All the creativity feels front loaded and the game as a whole would have felt more unpredictable were the different mission styles dispersed across the game. As it stands once you have finished the first world you have practically seen all there is on offer, without the frustrations of being pitted against far too many enemies at once. I get tense while playing, worried that I may die and lose all the progress I have made since the last save point. For anyone who has limited time to play, losing an hour’s progression in a long game is a huge deal, as you never really know when you may be able to replay it. With this in mind 'Alienᵌ' is a very, very scary game. You only get a password at the end of each level and not after each of the eight missions that make up that level. Being forced to play long stretches is not always possible and the game should make allowances for this. Once again save states on emulators offer a feature that should have existed in the game in the first place. Also the game demands focused play, and I actually found myself having to make notes to play it successfully. After accepting a mission, the central computer shows blue prints of the current stage showing objectives and destinations. From here you have to remember where you should go, as each of the different rooms look similar and without the game giving you on screen text it’s hard to know where you are sometimes. To make things more complicated some missions are even spread over more than one location, with some rooms only accessible through other rooms. Without writing down random things like “BS x6, AC2 >MA x4” I never would have been able to remember where I was meant to be going. It reminds you that 'Alienᵌ' is intended to be a game taken slowly, but it does make it one that doesn’t suit short play sessions. The 8 missions of each level will take up to an hour to finish, and careless death will mean going back to the start of the level. 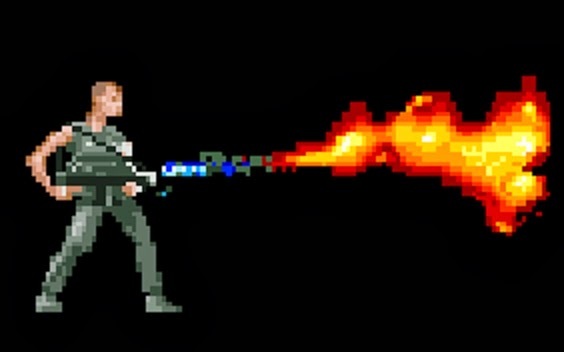 You may be treated to a voice sample saying “game over man” (a famous quote for ‘Aliens’) but that won’t soften the frustration it will inspire. At the time Total! magazine called 'Alienᵌ' “the best movie license ever”, much better than most other tie-in game released in the era and surpassing the film that inspired it. Taking the strengths of the 'Metroid' series and combining them with the mature sensibilities of its source material works on the whole brilliantly. Frequently scary (for the right and wrong reasons) and well worth playing. Though it can't beat the majesty of 'Super Metroid' the fact that it's possible to draw parallels between the two shows that it’s a game worthy of your attention. As Retro Gamer put it in a retrospective, “if only all film licences, no, make that all games, has this much effort put into them”. I have given up eBay for lent. It has been tricky and I’m convinced there are people selling rarities cheaply while I’m not looking. But what this has forced me to do is work through my ‘pile of shame’ and play games I’ve had for a while but not really played – distracted by the latest new and shiny thing. I got 'Alienᵌ' in what I generally consider “my best eBay bargain buy yet”. 9 boxed complete mint games, 7 of which were on my ‘to buy’ list, all for £80(ish). I chose to play it, because in my real life job I am actually (at the time of writing) just finishing editing ‘NASA’s Unexplained Files’ a TV Show for The Science Channel. It seemed oddly appropriate to play a game filled with aliens on my commute to work, while making a programme that tries to prove there really are aliens out there.